Here’s an inspiring story from Edinburgh. Thanks to Gail for sharing and for the great work carried out by Daniel, Lorenz and the team at Move Freely Sports + Spine. We think BUPA might like to thank Gail also, because after two years of neck pain, BUPA was willing to pay for neck surgery, which would cost £thousands. Instead she opted to have a programme of IDD Therapy. 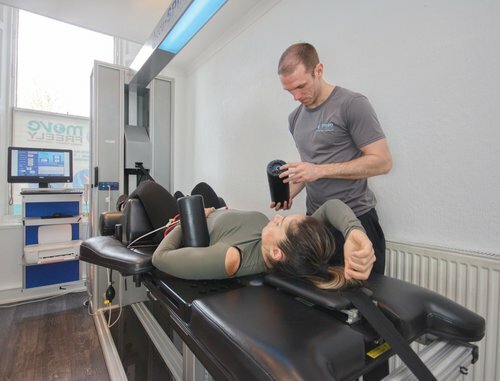 If you are looking for a back pain clinic in Edinburgh, then the team at Move Freely offer a complete non-invasive solution with arguably the best suite of technology and rehab equipment in the capital, as well as a passion to work closely with each patient. If you have back pain or neck pain and aren’t sure what to do next, or are fed up with going around in circles, the clinic can guide you on the right options for you.